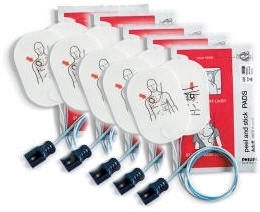 Adult AED Defibrillator Pads, five set, for the use of Philips FR, FR2, FR2+ AEDs. Recommended for patients 8 years and older, or above 55 lbs (25 kg). Constructed of a thin flexible conductor sandwiched between a protective non-conductive backing and a hydro-gel adhesive, these pads may be used for ECG monitoring, external pacing, synchronized cardio version and defibrillation. Soft, flexible and oval shaped, HeartStart Adult Defibrillator Pads conform to the body contours for ample surface contact and adhesion. The robust lead wire connector is ergonomically designed, enabling fast and easy insertion.